With its appealing contemporary look, Flex is a versatile collection conceived to reflect the needs and preferences of design enthusiasts who are creating stylish interior and exterior spaces. Characterized by clean lines and transitional styling, Flex represents the innovation and refined aesthetics for which the Brown Jordan brand and designer, Richard Frinier, are known. 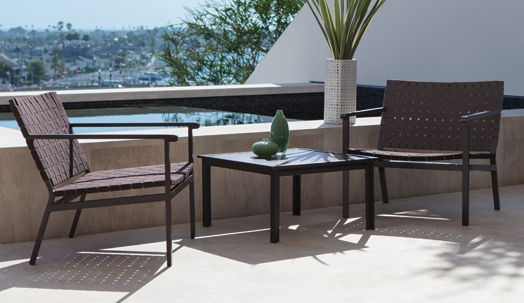 Designed to complement a variety of architectural styles, Flex is the next step in the evolution of classic strap furniture and ushers in an innovative new material category for outdoor furnishings. Each piece in the collection is built using resilient Suncloth® straps hand woven over a sleek powder-coated aluminum frame in a cross-strap pattern that provides comfort, function and style in equal measure. Click here to view the full Flex collection.